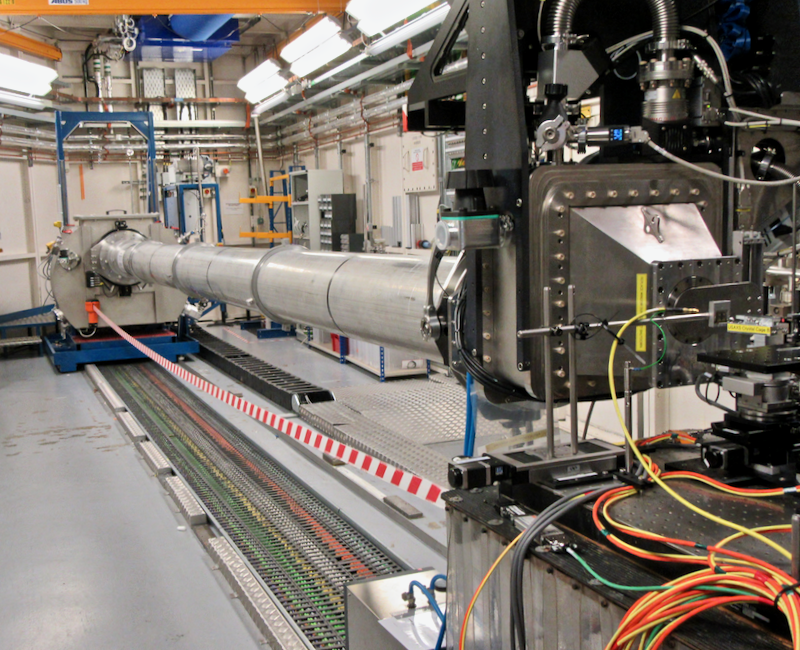 The USAXS platform as viewed from the front, with the synchrotron beam going from right to left. The installation had been in preparation for a few weeks, so the motors had been integrated in EPICS already, as had the encoders that are there to provide feedback on the fine yaw rotations (we didn’t use the USAXS electronics in the end..). These fine yaw rotations provide the ultra-small rotations of the crystals that allow for the ultra-small-angle scattering to be probed. With the addition of a small PIN-diode detector, we could align the upstream crystal, the sample stage, and the downstream crystal in turn. This was not without its own issues, though. It turns out that it is very easy to “lose” the beam in the process: with an unfamiliar instrument — most of whose components have to be lined up for a good beam to pass through — if any component becomes misaligned, you usually need to go all the way back to the beginning of the alignment. Until the moment we automated the alignment, and before we found out how to avoid accidental misalignment, the alignment was a tedious and quite labour-intensive process. Secondly, with motors on both crystal towers sharing very similar names, accidentally moving a motor on one tower when you meant to move the one on the other tower led to more than a few delays. Thirdly, most motors didn’t have encoders on them, so you tell the motor to move and you cross your fingers that it actually does, and does to such an amount as you specified. 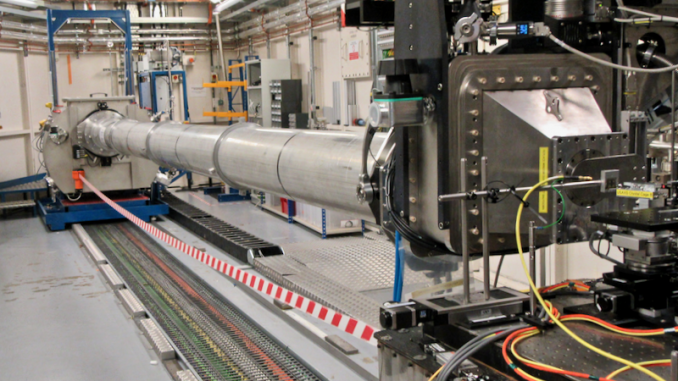 The USAXS platform as viewed from the rear, with the synchrotron beam going from left to right. The arms, actuators and encoder strips are clearly visible. Another day was spent debugging strange motor motions. This was one of the critical fine yaw rotations that we need for the USAXS experiment, and so could not be omitted. This whole saga appeared to start with me trying to fix a working system: I wanted to put oil on the contact point between the linear actuator and the arm, which went fine. Right after this, however, we got strange results as the linear actuator moved twice as far as the control system said it did! Fast forward a few hours, and we had completely messed up the motor settings beyond recovery, in an attempt to find a wrong setting. Together with the Diamond motion experts, we spent another several hours debugging the motions and the accompanying encoder strip. The culprit? Nothing to do with my oiling of the contact point or the motor settings, but a dodgy encoder input in the motor controllers! Other evidence also showed that the encoder readout might have started doing weird things even before my oily escapade. After that, it was more regular debugging: gaining an order of magnitude on dynamic range on the PIN diode by swapping the diode for one with a non-holey foil, gaining another by swapping the coaxial cable with a thicker, lower noise variant, and disconnecting practically unnecessary motor cables to avoid them placing additional torque on the rotation arm. During the beamtime, we also got started on the manuscript using Overleaf. This made us see some gaps in the measurements that would otherwise have gone unnoticed. It is not a silver bullet, though, as we later found another flaw in a set of measurements that really should be there (see the encoder troubles), but working on the manuscript certainly helped to put ourselves in the publication mindset to get a better overview of what’s missing. As discussed in the previous two data correction papers, we are not going to attempt desmearing this data, but instead use fitting programs with smearing capabilities. SasView is one, and we’re testing the same functionality in McSAS. Figure 1: USAXS scan of a 1-micron spacing between the supports of a SiN grating. Direct beam appears below q<1e-4 (1/Ångström). 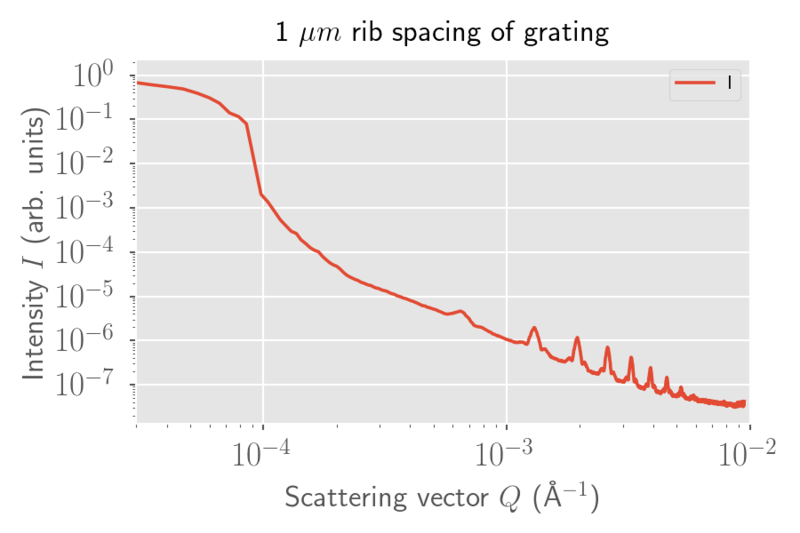 Without background subtraction, there are two “cool” datasets to show: one of a grating available at I22, whose support ribs are spaced about 1 micron apart (Figure 1), and a dataset from packed 500 nm silica spheres (Figure 2). Figure 2: USAXS scan of packed, dry 500-nm silica spheres. These two measurements extend a bit further than what this platform is intended to measure. 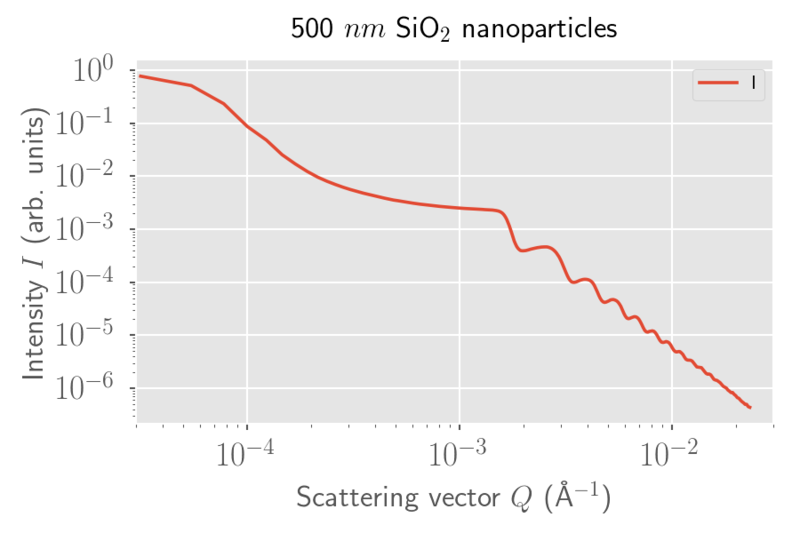 Anything beyond q ≈ 0.004 1/Å (0.04 1/nm) can be measured with a decent SAXS instrument, such as the one that happens to be installed at I22. That large flight tube in the last picture is one of I22’s longer settings, which lets them measure down to about q ≈ 0.002 1/Å with 18 keV photons. The SAXS data range thus overlaps nicely with the USAXS data (due to the lack of desmearing, we did not do this in a single graph). 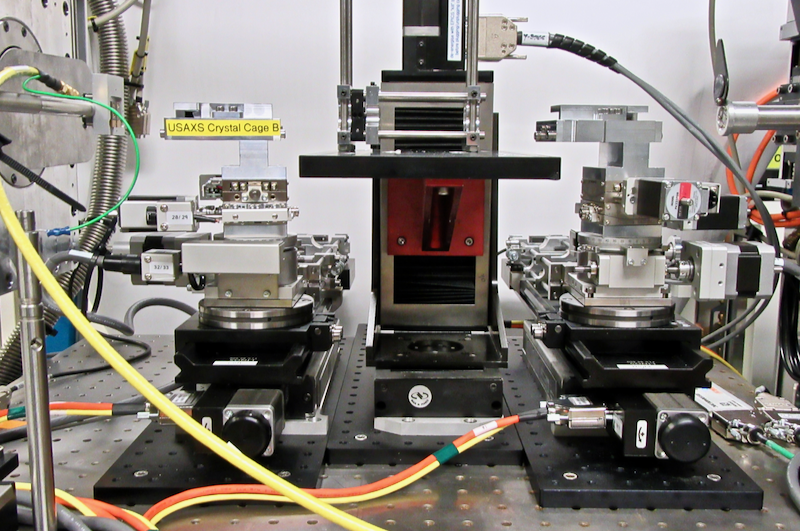 We did some final tests where the two were interleaved: a 10-minute USAXS measurement combined with a <1-second SAXS measurement, and the repeatability is remarkably good. 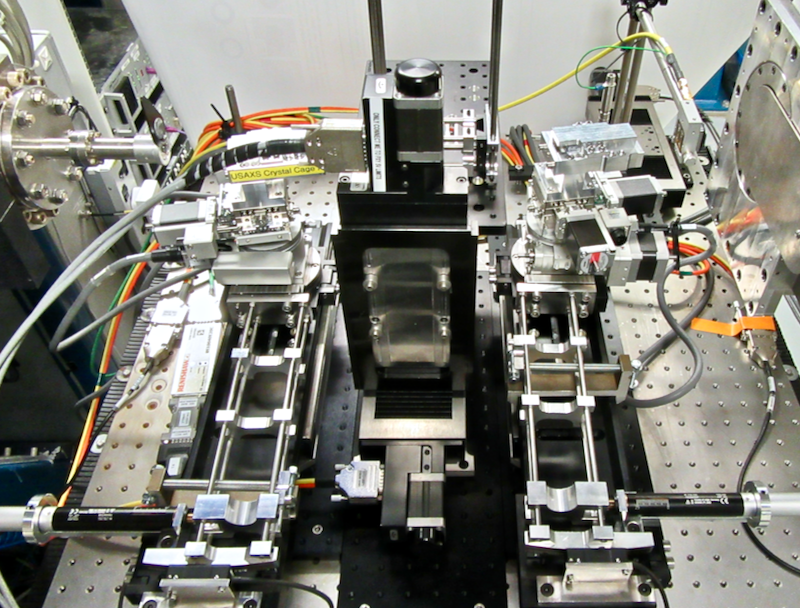 Although I see you are looking at the 10-minute figure… yes, that is a bit long for a synchrotron measurement, but we estimate this can be reduced significantly in the future with some special beamline magic. So, now you’re all up to speed on the latest and greatest experiment. The USAXS saga is far from finished, but hopefully we’ll be able to submit a publication in not too much time now. Stay tuned!